Still no cure for B.O. 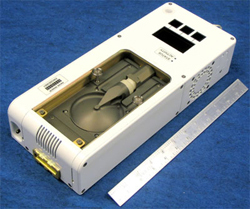 The same electronic "nose" designed to monitor air quality on the International Space Station is apparently also a deft nostril at sniffing out cancer. Neurosurgeons at the City of Hope Cancer Center along with boffins from the Brain Mapping Foundation and NASA's Jet Propulsion Laboratory say the US space agency's ENose can be used to detect brain cancer cells and cells in other organisms. NASA's ENose contains an array of 32 sensors composed of polymer films that change their electrical conductivity in response to different chemicals in the air. The digi-snout — able to detect contaminants within the a range of one to approximately 10,000 parts per million — can be trained to detect the different metabolic waste products emitted by cancerous versus normal cells, the scientists said. "This pilot study lays the groundwork for future research that may help us better understand cellular trafficking, contribute to designing better approaches for the detection and differentiation of brain cancer, and understand the pathophysiology of intracranial gliomas," said Babak Kateb, chairman of the Brain Mapping Foundation and lead author of the paper.